John Taylor always provides insightful work on macroeconomics and his latest piece as an op-ed in the SJ on April 22 is no different. The picture above is needs little explanation. The stimulus from a recession is expected to be temporary. This is counter-cyclical fiscal policy. Over time, the stimulus should be reversed as private sources of growth offset the government stimulus. Consequently, the discussion should be about the path to move back to the long-term government/GDP share. The Ryan deficit reduction path takes us back to the size of government that existed before the recession. Given the stimulus was supposed to jump-start the economy, this path is reasonable given it will take years to get there. 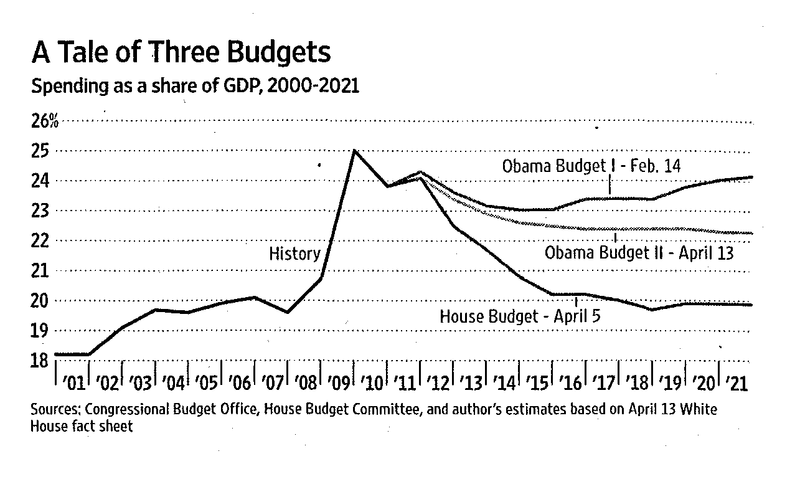 The original Obama budget would never get us to the old level. The size of government would permanently be larger. Even at the new Obama budget proposal, the size of government is still permanently larger. In this context, the budget choice relative to the long-term deficit is clearer. The end of the world is not coming if we are moving to a proposal that brings government back to pre-2008 levels. China is following a managed appreciation and has taken the yuan up to 6.5 per dollar which is the highest level since 1993. This solves a number of issues. It releases pressure from the global community on trade imbalances. It also serves as a mechanism to help reduce inflation through cutting the cost for imports. This is especially the case for food coming from the US. Finally, the gradual appreciation allows exporters to adjust to the lower revenues. This may allow companies to avoid losses. The PBOC has followed a steady policy of raising reserve rates, increasing interest rates, and allowing for appreciation all to stop inflation. We have not seen the impact on prices yet, but they are using all the tools available to control price gains. This was an important week with both the Treasury secretary and Fed chairman noting that we want a strong dollar policy. The quotes from each are below. The Treasury secretary is the person who usually takes the lead on dollar policy and Geithner was very clear on the US view. Bernanke was more nuanced in stating that a strong dollar policy is in the interest of the US and that his policies will get there in the medium term. "Our policy has been and will always be, as long as at least I'm in this job, that a strong dollar is in our interest as a country," he said at the Council on Foreign Relations. "We will never embrace a strategy of trying to weaken our currency to try to gain economic advantage," Geithner vowed, responding to a question about the dollar's recent slide. "The Federal Reserve believes that a strong and stable dollar is both in American interests and in the interest of the global economy," Bernanke said at a news conference. "In our view, if we do what's needed to pursue our dual mandate for price stability, maximum employment, that will also generate fundamentals that will help the dollar in the medium term." Hat tip to the Angry Bear blog on US AAA fear-mongering. When you look at interest payments as a percentage of GDP, the US debt problem looks more manageable. This, of course, at the currently extremely low interest rates. Nevertheless, it does provide some perspective that there is room to devise a budget that can be reasonable. The sky is not falling just yet, but a continued approach of pushing the problem forward is not sustainable. S&P has placed a negative outlook on the AAA rating for US Treasuries. S&P stated that there is "material risk" that the government will not a budget that will solve the ongoing deficit problem. If an agreement is not reached, S&P will view the fiscal position of the US significantly weaker than its AAA peers. The reaction has been swift. A sell-off in both bonds and stocks represents a flight to quality, but since the open bonds have rallied slightly but stocks have maintained their decline even though levels are off the lows. The expectation is that taxes will have rise and spending ill have to decline. This is a toxic combination for stock markets. China is serious about fighting inflation. It raised reserve requirements again by 50 bps to a record 20.5%. This is the fourth time this year and 10th since the start of last year. It has also raised benchmark rates four times since last October. The latest inflation numbers are at 5.4%. Food prices have increased much more and this is having a bit on real income. Wages have also started to rise and their are workers who will not move to the coastal areas at the current wages. This is turning into a classic wage price spiral with growth still coming in at 9.7% for the first quarter. While there has been more focus on the Fed and the potential end of QE2, the policies of the PBOC may be more relevant for the global economy. The variance on growth could be much larger in China which will have greater impact on emerging markets. A contrast in style and substance. Earlier this week we had the BRICS meeting that worked on reciprocal trade and finance discussions to advance their economic growth. Now we have the G20, the replacement for the G7 trying to do the same thing. There is a huge difference with the US pushing form exports through a yuan appreciation and a discussion of trade imbalances. China, on the other hand, is using its power as a buyer and a financier to advance their own growth through locking in raw material imports. The ascent of China is in sharp contrast to the rearguard action of the US as a continued serial debtor. The G20 agreed to have the IMF look at national levels of debt, budget deficits and trade balances to determine if these global economies are putting global economy at risk. The IMF will look at the US, China, France, Britain, Germany, Japan and India. The G20 has agreed on a set of "indicative guidelines" to "avoid disorderly movements and persistent exchange rate misalignments". They will also have "a strengthened coordination to avoid disorderly movements and persistent exchange rates misalignments" whatever that means. The statistical analysis of the IMF will not have any surprises. We know where the imbalances are. We already know what the broad answer will be on who is creating the imbalances. For example will the US as the great debtor or China as the great creditor respond to any policy prescriptions by the IMF. I think not. We also know what will be the answer to the problem albeit the extent of any change is subject to a deeper discussion. 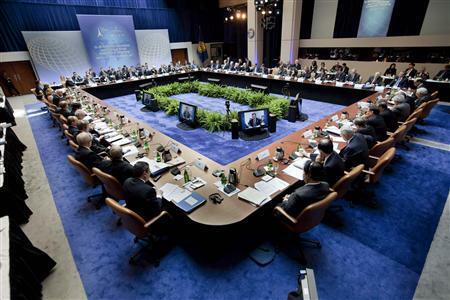 The G20 also discussed a framework for determining when countries can employ capital controls. This is another hot topic with many emerging markets desiring to have the freedom to use tools to stop hot money from entering or leaving their countries. The stakes are high but a problem is that a large portion of citizens do not pay taxes. Many of the richest taxpayers pay rates that are below the marginal tax rate of 35%. The tax code has to be changed to increase equity. Taxes should be used to raise revenue and not as a policy tool. The BRICS meeting was held this week in China. The BRICS countries are Brazil, Russia, India, China, and South Africa. This is a diverse lot with different growth rates and political systems, yet they have a two things in common which will affect the global financial system. First, they are all connected to China for trade relations. Second, they represent the most dynamic portion of the global economy. Their stated views on cooperation has been called the Sanya Declaration, with the theme "Broad vision, shared prosperity". Simply put, key countries are moving forward with trade relations outside the US dollar/EU euro system. As expected the BRICS meeting continued to bash the dollar dominated financial system. What is important is that these countries have started to work on developing credit facilities based on the yuan. China has the money and wants to use it to advance their trade interests. This is no different than the US at the turn of the last century. The US started to assert itself in credit markets before the fall of the sterling/gold based currency system. The USDA just produced a new report called Reciprocal Trade Agreements: Impacts on bilateral trade expansion and contraction in the world agricultural marketplace. The report shows the growing use of special bilateral trade agreements especially in agriculture which will restrict the flows of goods around the world. The restrictions will mean that price cannot serve as the determiner of trade flows. Those countries that set-up RTA will see a significant increase in trade at the expense of trade partners not affiliated with the RTA. The recent talks at the BRICS meeting in China is a place where a RTA will impact the US. China has an incentive to increase RTA to lock-in imports from resource exports like Russia Brazil. Resource exporters may like to sell supply forward to ensure markets. Neither is good for the US agricultural markets. With corn prices moving to new highs and soybeans staying in their high range this year,we can expect the continued march higher of farmland prices. Many key farmland areas are seeing double digit gains especially in the corn belt. This has all of the makings of bubble given the combination of high crop prices and cheap money. With real short-term rates negative, it is not surprising that any real estate investor is wiling to borrow to acquire this land. This is real estate market is very different form the housing market. The use of the land is cash flow positive, but a decline in crop prices or an increase in interest rates will have the expected effect on land borrowers. There will be a fall out. We have seen this before in the agricultural markets which see significant mean reversion of prices. Inflation looks like it is under control with the latest number released today. The headline rate is at 2.7 percent but the CPI less food and and energy is at 1.2%. However, the inflation story has a higher level of complexity based on the method used for calculating the inflation rate. The revisions for calculating inflation tries to account for the increased quality of goods. If you buy a computer which is more powerful as the one purchased two years ago, the price has declined. Given the revisions in calculating inflation, you cannot compare the inflation from the early 1980's with the inflation today. The method is different. The hedonic price method used today will lead to a lower inflation rate. However, there is a website which calculates inflation using the old method, John William's shadow government statistics. Using this method will provide a real eye opener with inflation actually touching 10%! Inflation is back, but we are just not calculating like the good old days. The yield curve has gotten steeper since the beginning of the year with 3-5 year gaining over 10 bps. The CPI which has just been announced has increased 2.7% so you have to move out beyond seven years to get a real yield which is positive. Even accounting for CPI ex food and energy you have to move out the maturity three years to get a positive real yield. This is all part of the Fed's plan. If you increase inflationary expectations and lower the real yield money will have to put to work and move out of cash. It has chased fixed income, but the fear of inflation has actually steepened the curve. Money will move to other risky assets. Silver and gold have been beneficiaries. Stocks have seen gains especially in risky emerging markets. Credit spreads have tightened. However, there maybe a disconnect between the fundamentals and prices based on the search for yield. This is environment is no different than the mid-200's when Chairman Greenspan lowered rates to stop deflation. We know this will end badly even if we started in a more opportune place. I am thinking about the Minsky ponzi financial lending environment. Often easy answers to are not forthcoming in economics. We just posted a story on the relationship between the Taylor rule and commodity prices which stated that the low real rates may have been responsible for the surge in prices. Now a study from the Federal Reserve of San Francisco suggests that the large asset purchase program QE and QE2 did not have an impact on commodity prices. The authors used novel approach to look at this problem which has often been used finance stock studies. An event analysis looks at the reaction of asset prices around announcements concerning large asset purchases. The story is very simple. If the large asset purchase programs will supply excess liquidity that will be used to buy commodities, there should be a price reaction when the new programs are announced. In the currencies, the dollar should be sold and commodities should be bid higher. Rates should decline. While rates behaved as expected, other asset classes did not see the expected price reaction on the announcement date. The sample size is limited, but the number suggest that the asset price reaction is a little more complex than initially expected. First, if there is strong uncertainty on the announcement date, there could be a general sell-off of risky assets. Second, the effect of purchase programs may not have an immediate impact on liquidity. As noted by the authors, it could signal that the economy is in worse shape than expected; consequently an asset sell-off. The change in inflation expectations may not be measured in a single day's return. What happens if there is a supply shock across a number of grain markets coupled with strong demand? The answer is easy, prices will rise across all grain markets. A Bloomberg story on pork binge could be driving soybean prices higher. The demand for protein through pork has doubled in the last two decades as the Chinese economy has grown. by over double. The average person in China will consume just under 40 kilograms of pork. This growth is expected with any rise in disposable income. The result of increased pig production in China is that the animals have to be fed. Feed can come in the form of corn and or soybeans and with high prices in corn, the demand for soybeans will increase further. It takes 2.8 pounds of feed to produce one pound of pork. The expectation is that soybean demand will increase 33 percent to 66.9 million metric tonnes which is more than what is grown in Iowa, the largest soybean producer. Iowa produced over 13 million tonnes last year. This is not much different than the demand for copper, coal, or other commodities. The raw inputs for protein production is needed in large quantities. China consumes one out of every four tonnes of soybeans produced and it imports about 60% of the global exports in soybeans. Growing more soybeans may not be the answer in the short-run because acreage has been committed to corn, a better cash crop. 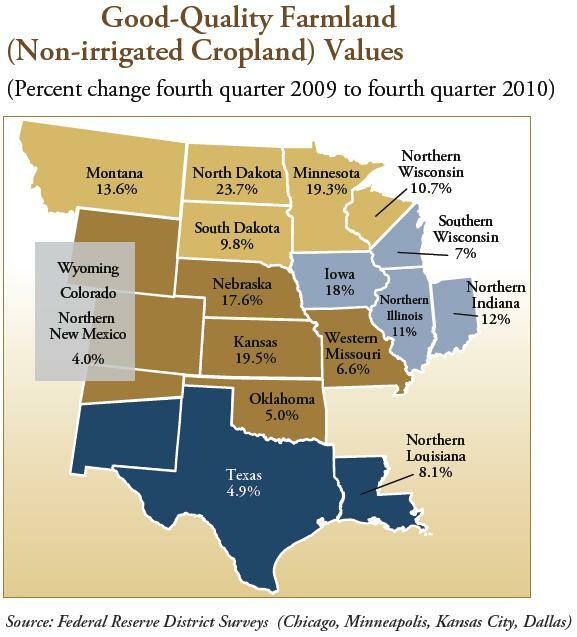 Soybean acreage will be down this year in the US by about 1%. It is unclear whether China has the capacity to increase domestic supply. The demand and supply shocks to grains will continue. 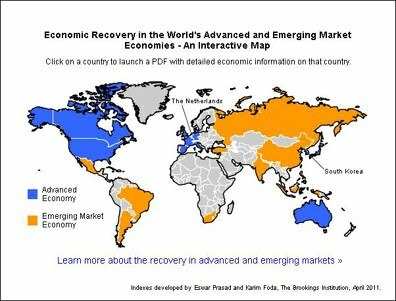 The Brookings Institute in conjunction with the Financial Times has developed a interactive tool on the economic recovery called the TIGER indices. TIGER stands for Tracking Indices for the Global Economic Recovery. The main tool is an interactive map that allows the user to click on a country and get a series of economic graphs on the current growth of a country. Along with growth, employment, confidence, financial, and consumer data is tracked for a broad set of developed and emerging market countries. It provides a quick update in a standard format for looking at economic progress around the world. 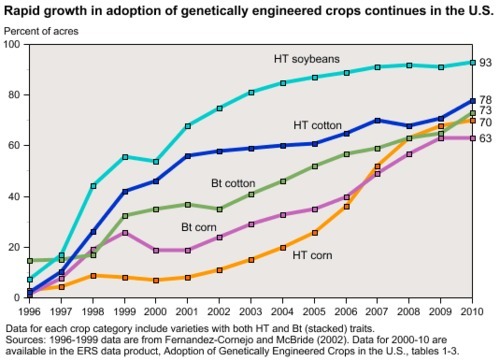 The recent data from the USDA on genetically modified crops shows a continued upward pace. to their use. The battle, if there ever was one, on their usage is over with over 2/3 of corn, 70% plus in cotton and over 90% in soybeans. This has been a boom for both farmers and consumers. Think what prices would be like in these crops if there were not genetically engineered seeds to help the growth process. However, there is a problem. 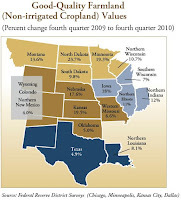 Where are we going to get further crop gains without more acreage planted? What happens if we do not have further innovation? What happens if there is a failure with the current GM seeds? These issues are real and can only lead to higher prices through a high risk premium. Hat tip to FT Alphaville on discussing the link between commodity prices and the Taylor rule for monetary policy. The work presented from Telluride asset Management looks at the cumulative difference from the Taylor rule for monetary policy and the cumulative log change in certain commodity prices. The result is a strong link between monetary easing and commodity prices. The link between negative or low real rates of interest and commodity prices has been well documented but this work places a nice twist in the subject through looking explicitly on the ease or tightness of monetary policy. By this broad measure we should still see continued increases in prices as long as the excess liquidity of the Fed is present. The Taylor Rule can be looked at two ways. First, historically we can see that the Fed may have been too aggressive with easing during the post tech boom. The Fed also began easing very quickly in early 2008. Second, when the Fed too rates down to 25 basis points, the Taylor Rule suggested that rates should actually be negative. This is the zero rate problem which required the need for quantitative easing, "unconventional" policy, or a large asset purchase program. The current low environment makes it more difficult to judge policy, but the Taylor Rule is suggesting less easing is necessary and that there is little reason to raise rates this year. What is driving silver? A bubble? There is a fundamental story for rising silver. 40% of silver demand is driven by industrial use versus 11% for gold. Demand will increase based on its property to conduct electricity. Silver is employed in every cell phone and PV cells for solar use. These are good arguments but not as strong as the investment story which shows that speculative buyers are the man driver of the market. ETF purchases of silver have outstripped the demand for gold in the last few weeks The ETF demand is as strong as any market. The bubble argument for selling is that it has gone up too fast as measured by momentum or technical indicators. The silver to gold ratio has increased to 80's levels and again would say that silver is overbought. Of course, markets cannot go up forever, but this argument tells us nothing about when it will top. Nevertheless, this will not stop many for saying I told you so when it eventually declines. Bubble may be too strong a word, but excess momentum is clear. The difference in wording is small, but the result is still the same, not a buy opportunity. There is a strong desire to find a new measures of market fear in order to prepare for the next market downturn. The VIX index has been the fear measure of choice as a measure of volatility, but a better measure may through a measure of skew. The CSFB fear index prices out a zero-cost collar between a three month SPX call at 10% out of the money and a put that could be bought the proceeds from selling the call. The proceeds for the fixed call sale are used to buy an out of the money put. If there is more premium from the call, the value of the fear index is the amount of out of the moneyness of the put. A higher level is more likely associated with market extremes. We are at those levels albeit no where near the index levels set pre-financial crisis. This is a variation on the risk reversal theme of fear indicators. This may be a good adjunct to VIX index and with fixed income indicators like the OIS or TED spreads. The OIS and TED spreads have both been moving up since the beginning of the year. China reported its first quarterly trade deficit in seven years at -$1.02 billion. Imports have surged by over 30% to over $400 from the previous year. The trade surplus is expected to be only $150 billion for the year. This compares with a trade surplus almost double in 2008. The trade surplus have been declining for the last three years. A key reason for the deficit has been the surge in commodity prices which have increased Chinese import costs even with volume not growing significantly. Now inflation is being imported with these higher commodity prices.This may not have been expected, but it is a result of the loose monetary policy of the Fed. Nevertheless, it will be harder to argue for a faster increase in the yuan with trade surpluses decreasing at such a fast rate. The balancing of trade is occurring through other mechanisms than the exchange rate. The exchange rate will still have a reason to increase to allow imports to become cheaper since many commodities like oil are denominated in dollars. Take away the policy rhetoric. Market forces are driving the potential for exchange rate moves. The latest numbers on the amount of money invested in commodities were reported in the press. There is close to $367 billion in assets under management in commodities with a boost of $5.2 billion in the first quarter. Once the numbers are reviewed in more detail it is less clear whether investors are using commodities as a a diversification tool. $155 billion of the $367 billion is in ETP's. This is the portion that is treating the commodity markets like another equity market. $120 billion of the ETP AUM is associated with precious metals, $9 billion is linked to the energy markets, and only $19.5 billion is exposure to the broad based commodities. It s surprising that the majority of the ETP exposure is concentrated in gold which does not track or represent broad based exposure to commodity markets. Investor are not buying commodities for their diversification benefit as much as they are buying for the unique exposure to the gold market. If the conditions for gold change, these investors will be disappointed and they would never have received the price appreciation from the supply shocks across the broad set of commodity markets. ECB and rate tightening - QE at a price? The ECB has taken the first step to control EU inflation by raising rates from 1 to 1.25 percent. This is the first time that the ECB has raised rates since 2008. ECB president Trichet, however, stated that monetary policy is still "very accommodative". The reason for the rate raise has been the increase in inflation above the 2% target set by the central ban. Many are perplexed by the increase given the sovereign debt crises and the fact that the inflation increase is loosely tied to food and energy costs. While Germany s doing well, many of the other euro countries are seeing a fragile recovery. This action certainly is at odds with the views of Fed chairman Bernanke. It is seldom that the ECB will take the lead relative to the US central bank. Our take on the action is that it sends a signal to the market that the ECB wants to be viewed as an inflation fighter even though they are willing to provide a significant amount of liquidity. Their policy is quantitative easing at a price; nevertheless, the price is not high given that real rates are still below zero. Commodity markets saw increased volatility with both the Japanese earthquake and the Libyan crisis creating tail events which drove market flows to safety. Both events were unexpected in size and scope and caused an increase in the market risk premiums and herding behavior as a reaction to the unknown. Nevertheless, strategy and market diversification provides an easy way to protect against tail events especially those that are concentrated to one market or asset class. Tail events, however, can have a mixed effect for active trading if there is limited follow-through or sudden reversals. Active trading may cut exposures at the wrong time through automatic stop-loss methods; consequently, it is critical that traders carefully assess unique market situations. As portfolio managers, it is all the more important to understand the mix of trading strategies within an active portfolio. What makes a tail event? The current buzz in risk management has been on hedging tail events, yet there seems to be little discussion on what constitutes a tail event and tail risk. Should a tail event be defined as a unique or surprise market situation which does not occur frequently, or should it only be a price move that falls in the extreme left hand side of the sample distribution. The distinction is important. Rare events do not always generate large price moves and not all price moves are tied to rare events. Broad generalization concerning the chance occurrence of “black swan” events does not have meaning without acknowledging that surprise events have to be tied to market reaction and to the underlying knowledge about the probability of rare events. One man’s tail event may have been fully anticipated by another. Tail events and risk are related to the knowledge or scenarios generated by a portfolio manager. Additionally, tail events have to be placed in the context of probability and size. It is the exposure not the chance that determines risk. 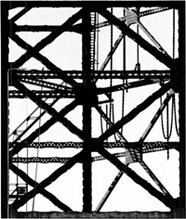 In the case of the Japanese earthquake and the nuclear disaster afterwards, the sequence of events was not anticipated by the market. By that definition, those were tail events, but a close examination of price action suggests that they were not broad tail events as measured through longer-term time horizons or across all asset classes. The shocks from the financial crisis of September 2008 were deeper and more broad-based. Still, it may be early to see the longer-term implication of these events. Of course, the immediate reaction to the earthquake was a strong negative move. For some companies and localized markets, this natural disaster tail event is unquestionable and will be long-lasting. However, for a broader global portfolio, the tail event impact of a localized shock is less clear. Many markets by the end of March were higher and look as though they have not been affected by the earthquake. In that sense, was the earthquake a true tail event? Similarly, for longer-term investors, the definition of a tail event is unclear. Monthly returns were in many cases not out of the ordinary. Hence, tail events have to be looked through the context of time horizon, trading activity, and portfolio diversification. Tail event risk is most easily mitigated through the broadest form of diversification. An oil price shock from the Libyan uprising could be considered a different type of tail event. While the place and timing of the oil price shock was a surprise, the fact that there will be a price spike on Middle East unrest is well-known and the expected price response is more predictable. The trading behavior should be different in this situation. Central bank communication - is there too much? The courts had to force the Fed to reveal the list of borrowers from the discount window. The information showed foreign banks as the largest users of the Fed facility. Th information was embarrassing that fact that Fed had to be forced to provide the information as not a shining moment of transparency. However, the financial world did not stop and the truth did not cause a massive sell-off for financial institutions. Central bank communication is good. However, too much central bank information can also be a problem. Fed Chairman Bernanke is planning to hold a regular press conference starting at the end of April. While this should be informative, it creates a new set of problems. Markets will be focusing on the verbal communication of the Fed and not the actual fundamentals numbers. Communication can be subject to nuance and subtlety. It can be ambiguous on a turn on phrases. Do you believe the words from the central bank or the actual money flows? Academic research already shows that the market will jump on communication changes. Should the market be surprised by Fed announcements? Communication can best come through consistent, stable and clear policy actions. If this is done, there may not be a strong need for the speeches and press conference.